This image from the High Resolution Imaging Science Experiment on NASA's Mars Reconnaissance Orbiter shows the Mars Exploration Rover Opportunity near the rim of "Victoria Crater." Victoria is an impact crater about 800 meters (half a mile) in diameter at Meridiani Planum near the equator of Mars. Opportunity has been operating on Mars since January, 2004. Five days before this image was taken, Opportunity arrived at the rim of Victoria, after a drive of more than 9 kilometers (over 5 miles). It then drove to the position where it is seen in this image. 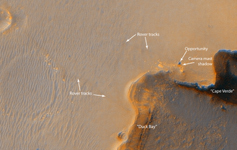 Shown in the image are "Duck Bay," the eroded segment of the crater rim where Opportunity first arrived at the crater; "Cabo Frio," a sharp promontory to the south of Duck Bay; and "Cape Verde," another promontory to the north. When viewed at the highest resolution, this image shows the rover itself, wheel tracks in the soil behind it, and the rover's shadow, including the shadow of the camera mast. After this image was taken, Opportunity moved to the very tip of Cape Verde to perform more imaging of the interior of the crater. This view is a portion of an image taken by the High Resolution Imaging Science Experiment (HiRISE) camera onboard the Mars Reconnaissance Orbiter spacecraft on Oct. 3, 2006. The complete image is centered at minus7.8 degrees latitude, 279.5 degrees East longitude. The range to the target site was 297 kilometers (185.6 miles). At this distance the image scale is 29.7 centimeters (12 inches) per pixel (with 1 x 1 binning) so objects about 89 centimeters (35 inches) across are resolved. North is up. The image was taken at a local Mars time of 3:30 PM and the scene is illuminated from the west with a solar incidence angle of 59.7 degrees, thus the sun was about 30.3 degrees above the horizon. At a solar longitude of 113.6 degrees, the season on Mars is northern summer. This is an enhanced-color view generated from images acquired by theHiRISE camera using its red filter and blue-green filter. Images from the High Resolution Imaging Science Experiment and additional information about the Mars Reconnaissance Orbiter are available online at: http://www.nasa.gov/mro or http://HiRISE.lpl.arizona.edu. For information about NASA and agency programs on the Web, http://www.nasa.gov. JPL, a division of the California Institute of Technology in Pasadena, manages the Mars Reconnaissance Orbiter for NASA's Science Mission Directorate, Washington. Lockheed Martin Space Systems is the prime contractor for the project and built the spacecraft. The HiRISE camera was built by Ball Aerospace & Technologies Corporation and is operated by the University of Arizona.